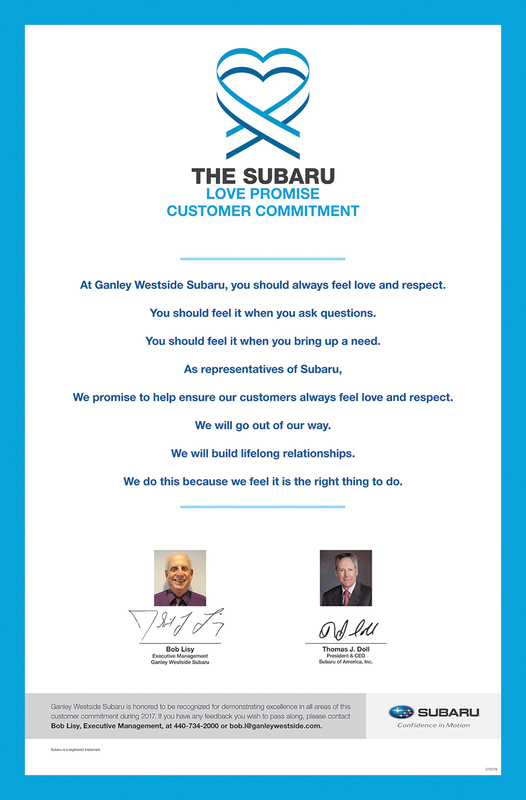 How is Ganley Westside Subaru dedicated locally to the Love Promise? Did Ganley Westside Subaru go above and beyond, provide exceptional service, or support causes that are important to you? We'd love to hear about it. Westlake (OH) Meals on Wheels is blessed to be opening a second kitchen in July to expand our reach to new clients in an underserved area. Our 50th Anniversary Outback has been instrumental in transporting items -- shelving, food, pots and pans -- to our new location.The branded vehicle is giving us an opportunity to recruit new clients as we move betwwen locations and are aked what we do and how to sign up. 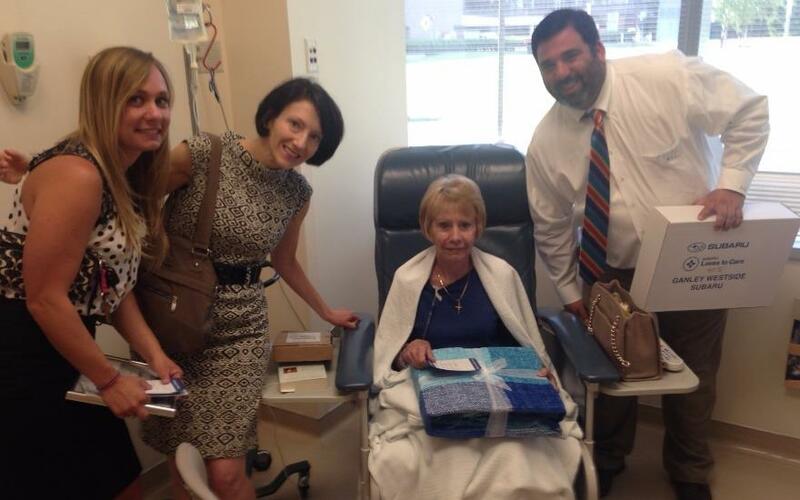 When Nicole Shaw, Subaru Customer Service lead at Ganley Westside Subaru, began delivering blankets to the Cleveland Clinic Taussig Cancer Center three years ago she had no idea the impact it would make on her personally. Blood cancers are often a "hidden" disease until you know someone diagnosed and that is what happened to Nicole. Nicole, who truly embodies Subaru’s “Loves to Care” motto has always shared her smile and warmth during these visits. Last year, however, the significance of a blanket, notes of encouragement and a warm smile hit home. Nicole’s beloved grandfather died prior to last year’s delivery - of a blood cancer. “Now I do this to honor him,” said Nicole. And honor him she does! 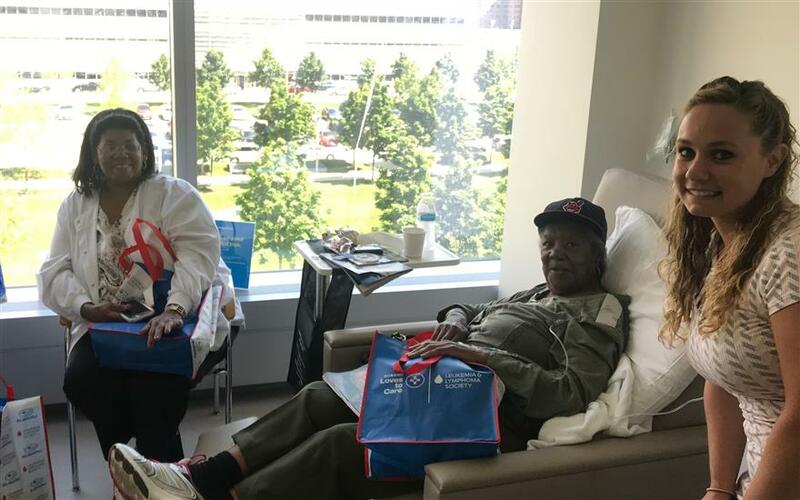 This year Nicole had the chance to meet a life-long Indians fan, Ethel, who was undergoing treatment surrounded by her family. After presenting the gifts, Ethel and her family were beaming. “I never knew how cold it could get in these rooms! It’s the middle of summer! It seems silly! It’s just a blanket after all, but it makes all the difference. Your visit was the bright spot of my day," said Ethel. The staff at the Cleveland Clinic Taussig Cancer Center were thrilled to partner with Ganley Westside Subaru again. 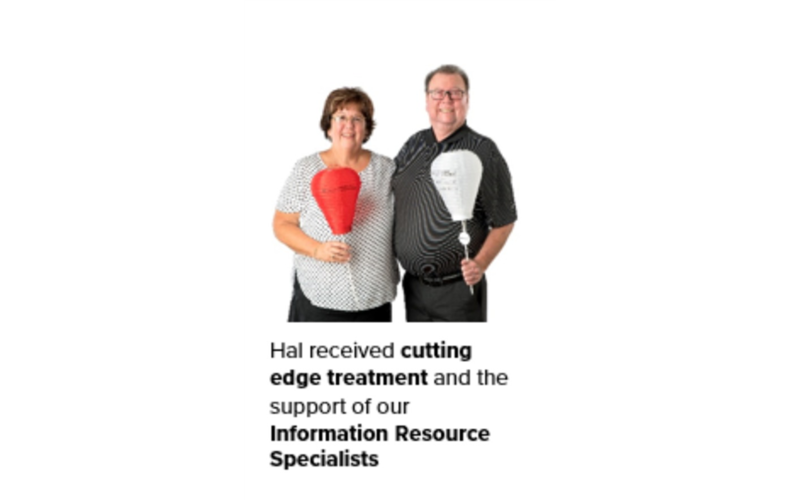 “The impact of these visits is like that pebble in the pond adage – your act of kindness inspires all of us – staff included – to take the extra step to make what is a challenging time a bit brighter,” said one staff member. “I always look forward to these visits from Subaru. Not many car retailers do this sort of stuff!" The Northern Ohio Leukemia & Lymphoma Chapter is grateful for Ganley Westside and Subaru of America. 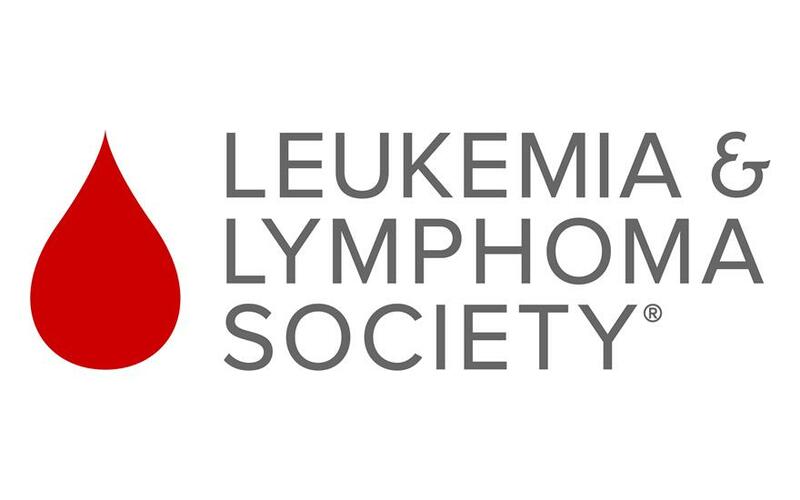 Their commitment to The Leukemia & Lymphoma Society puts the words "where love meets hope" into action in our community. If Beating Cancer is in our (LLS) Blood than caring and making a meaningful difference is in Subaru's blood.Thank you, Nicole and Ganley Westside Subaru and The Cleveland Clinic Taussig Cancer Center. Together, we are leading the way to cancer cures. Local residents who receive Meals on Wheels services got something extra in their deliveries this Christmas season. 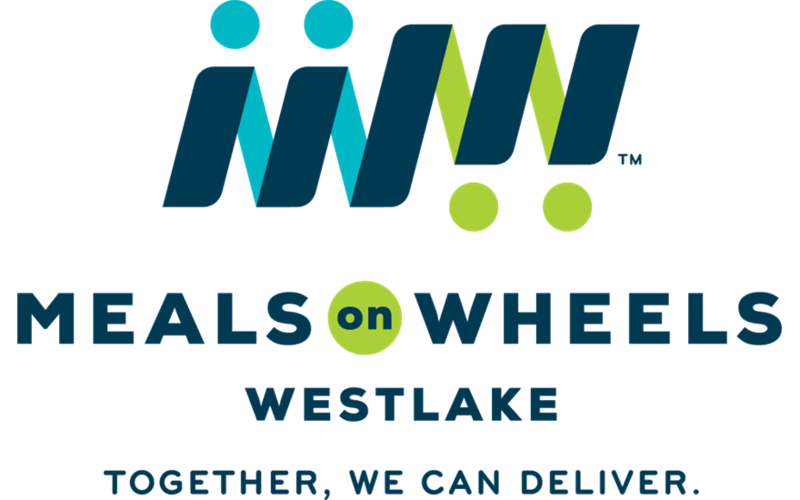 Westlake Meals on Wheels delivered December meals with a twist to clients in our four-city service area - winter emergency kits. Each kit included a warm blanket and non-perishable food for two or three days if our kitchen can't deliver their usual meals during bad weather. And all these kits were delivered in our new Subaru Outback from Subaru of America.Area residents helped us "stuff the trunk" of our new Outback at a food and blanket drive held in November at North Olmsted Community Park. On a brisk, sunny day, 50 blankets and easy-to-prepare foods were donated. When combined with the generous gift of non-perishables donated by Ganley Westside Subaru when we received the car, more than 400 pounds of food were collected.Community officials, like Westlake Mayor Dennis Clough and Olmsted Township Police Lt. Mark Adam, rode along in the Outback to help make deliveries in their communities, to the delight of our clients. They distributed the meals and emergency kits on our regular delivery routes. 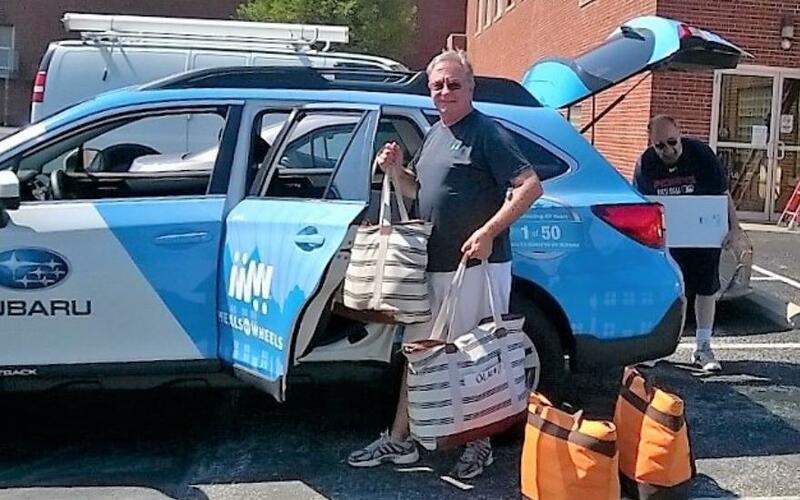 "We reached out to the local communities and the mayors and police departments seemed to be a natural fit to help us deliver the emergency kits," said Executive Director Wendi Schwartz. "Our clients were so appreciative and responsive to them." Mary, one of the recipients in Olmsted Township, delivered meals for the program for 14 years in the 1990s. She is now receiving meals as she ages in place at her home and thanked both Schwartz and Adam for the emergency kit. Barbara, an 85-year-old antique dealer who is a temporary client after a hospital stay, said "the food supplied is usually delicious. I love the meals. Some of the desserts are to die for." 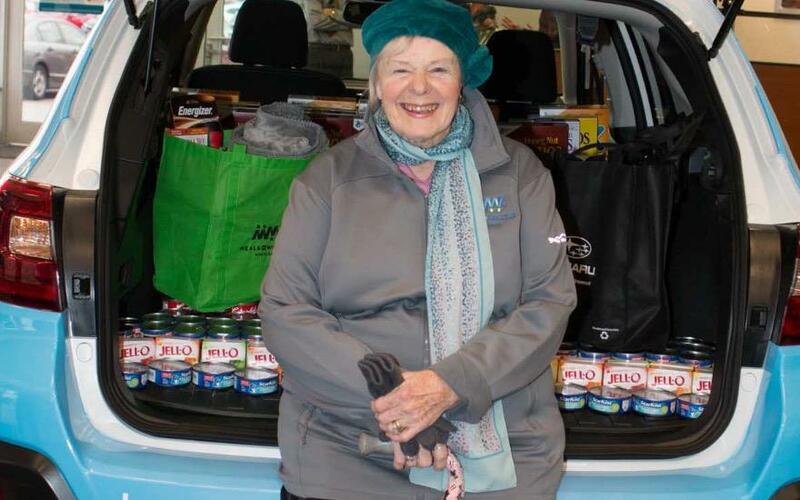 She was delighted to see the mayor and thanked him for supporting Westlake Meals on Wheels.The 2018 Outback has come in handy during Ohio's tough winter as our service area has expanded from12 to 40 square miles in the past three years. "Our clients rely on us to deliver them a hot and a cold meal each day," Schwartz said. "Sometimes our volunteer drivers are the only person a recipient sees each day. We provide a daily wellness check that gives them and their families peach of mind. "A third of our clients are 90 or older. The day Clough rode along, Westlake Meals on Wheels was throwing a 100th Birthday party for Preston, our oldest recipient. More than a dozen volunteers who love delivering to him gathered to present him a flower cake, balloons. Clough read and presented a proclamation declaring Dec. 14 Preston Symon Day. Then the volunteers sang a special birthday song. "It's one of the best birthdays I've ever had" Preston told the crowd.Westlake Meals on Wheels has been operating for 43 years. Recently we stepped in to serve three adjoining communities who lost their food deliver services, which has doubled the number of meals we deliver to 65 daily. The Outback in helping us expand our outreach to those communities. About 80 volunteers, out of around 170, show up each week to prepare meals, bake and deliver meals. 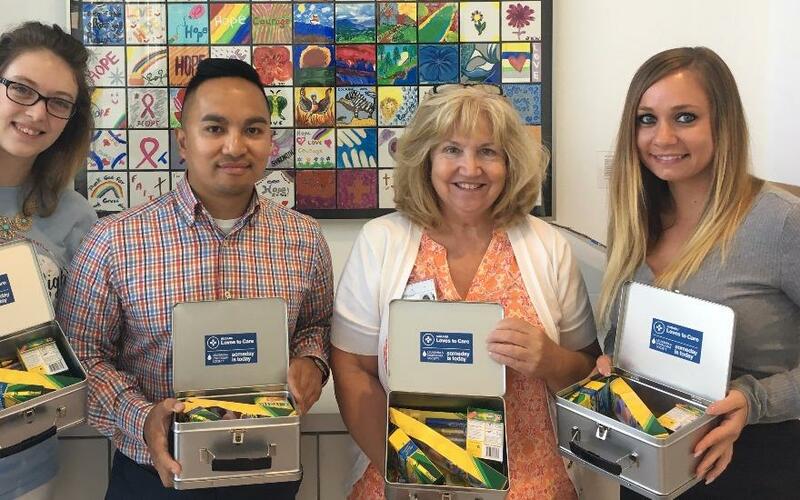 The Leukemia & Lymphoma Society loved partnering with Ganley Westside Subaru to delivery warm blankets & art supplies to patients in need. Meeting new people awaiting treatment and introducing Subaru and LLS to them for the first time with a arts and crafts box is a fun way to spark up a conversation. We enjoyed delivering new art supplies to our friends at the Cleveland Clinic Taussig Cancer Center, and learning out the beautiful tiles pictured behind us. Each tile was painted by a patient or a loved one in honor of the studio's grand opening. This partnership has reminded us that our organizations have the opportunity to make a difference in the smallest details of people’s lives. By showing concern in their times of trial, we truly bring light (and a little color) to the darkness of cancer. 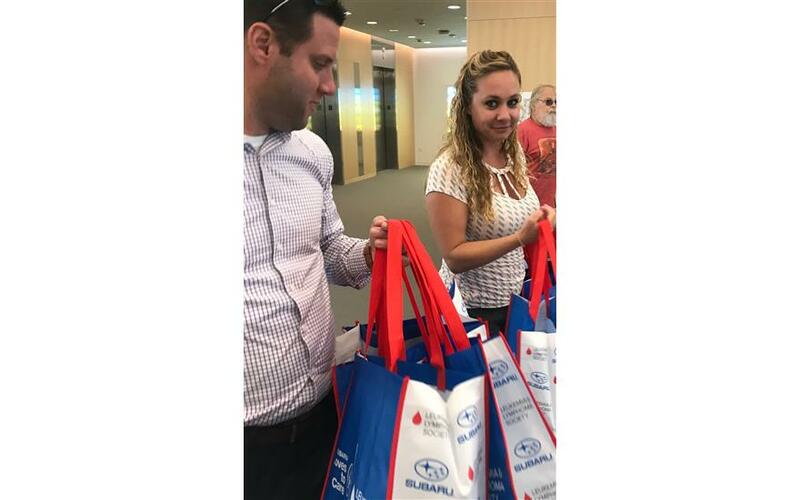 On Monday, July 11th, representatives of Ganley Westside Subaru were proud to visit with Leukemia & Lymphoma patients at the Cleveland Clinic. 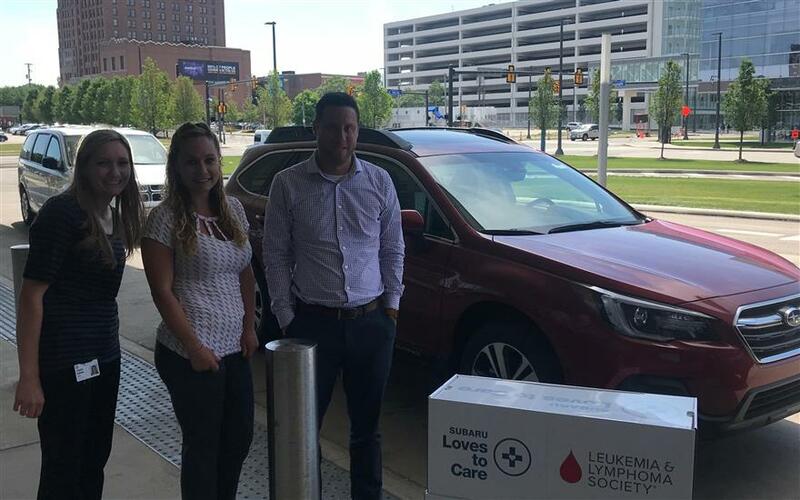 Kevin Amolsch (Subaru Sales Manager) and Nicole Shaw (Customer Service Representative), both of Ganley Westside Subaru, coordinated with the Leukemia & Lymphoma Society to present 100 new blankets to patients currently fighting cancer. Both Kevin and Nicole were glad to spend their morning helping to provide some comfort and drawing on the inspiration of some truly courageous people. 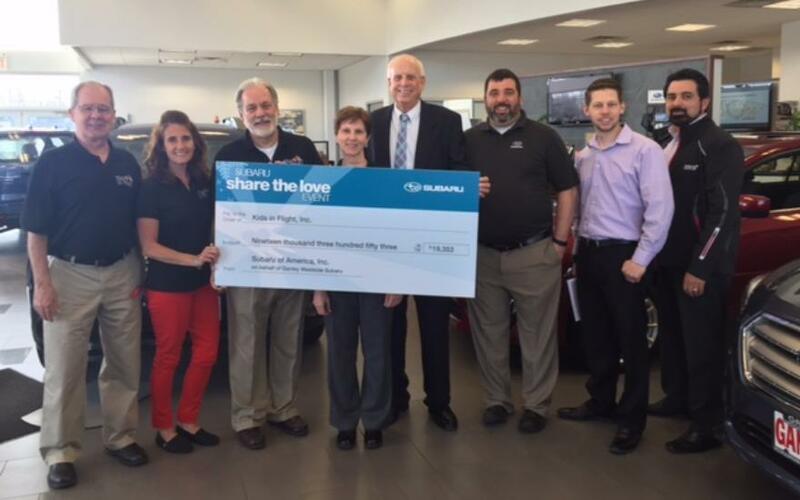 Ganley Westside Imports & Subaru of America are proud to donate $19,353.00 to Kids in Flight as part of the Share the Love initiative. This is the third consecutive year that Ganley Westside and Subaru have presented Kids in Flight with a check. Kids in Flight uses aviation to empower children with serious illnesses or disabilities and their families through flight experiences and educational programs. 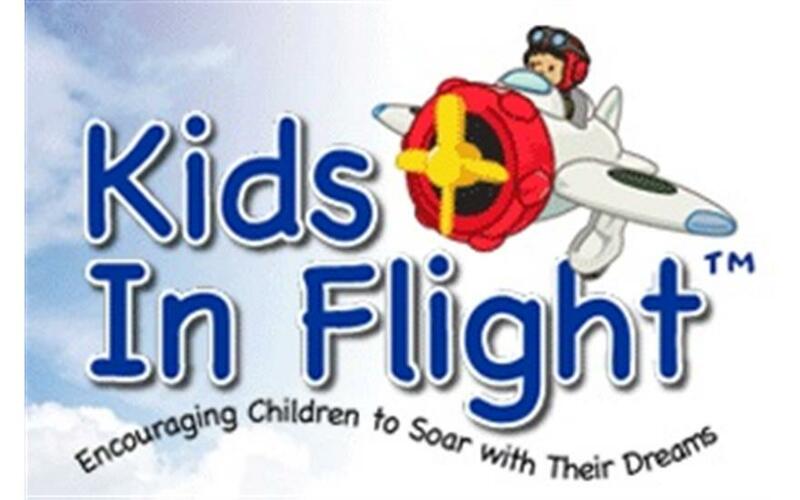 for more information regarding Kid's in Flight, visit: www.kidsinflight.org . 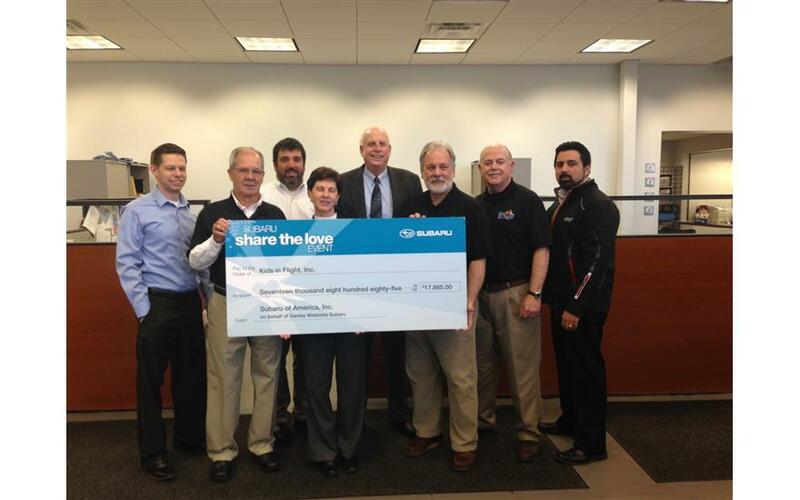 Ganley Westside Subaru was able to raise $17,885.00 for Kids in Flight during the Share the Love Sales Event. Kids in Flight is a local charity which provides small plane flights for children with serious illness or disabilities. Through a variety of exciting, fun-filled programs and the thrill of flight, children and their families share unique bonding experiences that will be remembered forever. 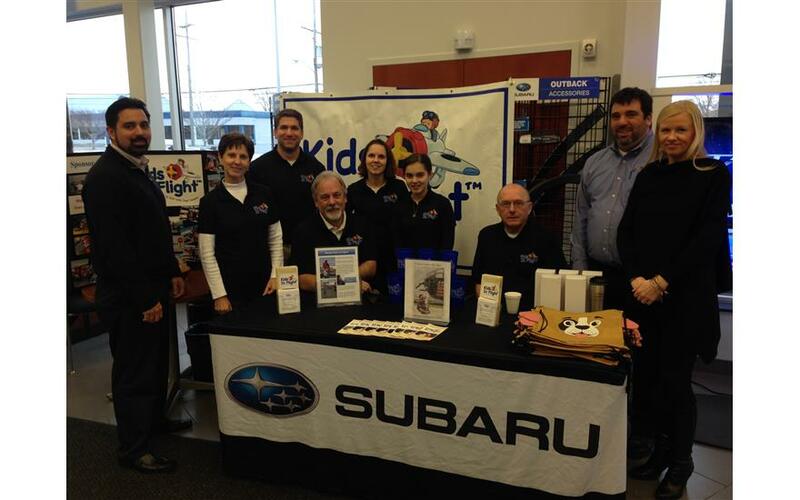 The Kids in Flight team visited our showroom in North Olmsted, Ohio on Saturday, December 27th to raise awareness of their charity. Based in Northeast Ohio, Kids in Flight is a non-profit organization that uses aviation related activities and airplane rides to give children with serious illnesses or disabilities an opportunity to escape by soaring above their crises, complications and struggles.